In 2002, Learning Prep School began implementing a system of visual tools into grades 2-12 curriculum. These tools, called "Thinking Maps®", are an exciting way to teach students to think on their own and process information independently. They were developed by Dr. David Hyerle in 1988 and are based on our fundamental thinking processes. Thinking Maps (implemented in over 6,000 school districts worldwide) assist with understanding these eight thinking processes in a way that is clearly defined and common to teachers and students alike. Using Thinking Maps school-wide across the curricula, students learn more effectively and efficiently, enabling learning objectives to be covered in less time and with greater retention. In addition to promoting integrated thinking and interdisciplinary learning, Thinking Maps are used by teachers to assess progress, gauge knowledge, track performance, and even assess their own lessons as they discover what students have learned from class. One of our goals is to increase cognitive development; as students become fluent in Thinking Maps, they’re able to apply multiple skills to problem-solve and develop higher-level, inferential thinking. Some students progress independently to the next level, multiple mapping, using two or more maps together to organize information. This strategy facilitates higher-level cognitive skills; concepts are elevated from the concrete level to abstract and inferential patterns of thinking. Thinking Maps provide a visual language that works in every grade, every subject, and at any level of academic activity. Students are able to organize and see their own thinking, and teachers can observe the students' thinking processes. Thinking Maps software allows students to customize the maps to lesson requirements in class, in the computer lab and at home. This has proven to be a particularly effective accommodation for dysgraphic students who have difficulty constructing the maps independently. Learning Prep School is a nationally recognized, award-winning leader in the integration and application of Thinking Maps in the classroom, home and at work: In 2006, the Thinking Foundation awarded Learning Prep School the first Dr. Albert Upton Award for our "groundbreaking, foundational work on the facilitation of thinking through the use of Thinking Maps®. Thinking Maps have been used at LPS consistently since their introduction, and the results have been impressive. Higher overall MCAS test scores (in conjunction with the use of allowable accommodations); most notable are the increases in "advanced" and "proficient" ratings over the "needs improvement" rankings typically scored by our population. Increased reading comprehension; our students' improved MCAS open response scores further verify this point. Many of our students now earn scores of "2, "3", and "4" on open response questions (with "0" being no score earned and "4" being the highest ranking possible), as contrasted with previously earned "0" and "1" scores. Results at Learning Prep parallel the national average after Thinking Maps are introduced. When integrated school-wide throughout the curricula, test scores demonstrate considerable gains (usually a 30% increase, according to Thinking Maps, Inc.). Students develop a higher level of thinking (application and evaluation) while working on recall and comprehension skills. Many students' attitudes have become more positive toward learning. Most students demonstrate improvement in their ability to organize thoughts. The quality of learning has been taken to a higher level; activities have become more meaningful and relevant. Teachers who have used Thinking Maps to plan lessons and develop curricula have noted improved organization and focus. Thinking Maps are implemented school-wide at the start of every academic year with one map introduced per week. This helps to re-familiarize returning students while teaching the maps to new students. A carefully orchestrated roll-out across departments enables students to practice using maps one at a time and not become overwhelmed. All students set up a section of their binder devoted to strategies and reference sheets. In the Elementary and Middle schools, this section is called the "Tool Box"; the High School refers to it as the "Reference Section." Thinking Maps are included, in addition to other helpful reference information such as grammar, common adjective endings and writing/editing checklists. Thinking Maps posters are displayed in classroom and therapy areas, along with "Desk Maps,” an effective strategy for teaching cognitive functions and social communication. Samples of student Thinking Maps are filed in our "Thinking Maps Library," along with videotaped sample lessons and training presentations. Staff are observed and evaluated on their use of Thinking Maps each year. Learning how to work with others is a life skill that is equally important as mastering the curriculum. Using Thinking Maps lessons as a foundation, interactive activities and group work augment cognitive skill acquisition and social skills development. 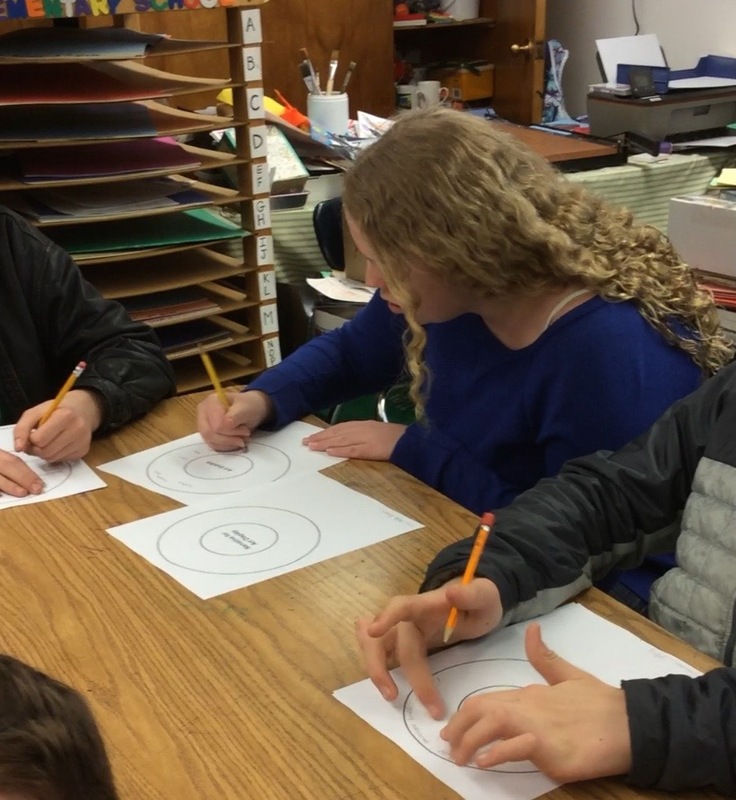 Cooperative learning is an effective way for students to embrace turn-taking, role-playing, self-control, cooperation, responsibility, and problem-solving. We look forward to watching our students grow as they become more fluent with these effective visual tools. LPS is pleased to be on the forefront of this innovative educational trend. LPS is featured in the following book, available on www.amazon.com: Visual Tools for Transforming Information into Knowledge by David Hyerle (the capstone chapter features LPS). For more information on Thinking Maps®, visit: www.mapthemind.com and www.thinkingmaps.com. Thinking Maps are graphic organizers for the eight ways we analyze information.